Use the Lighting Digital Adapter with your iphone, ipad, or ipod with lighting connector. It supports mirroring of what is displayed on your device screen including apps, presentations, websites, slideshows and more to your HDMI-equipped TV, display, projector or other compatible display in up to 1080p HD. ◆Compatibility with numerous Apple devices: iPhone/iPad/iPod, audio/Video transfer to display/projector/TV with HDMI port. ◆ Most Apps Support: YouTube, Office, Safari, Chrome, Facetime and more on your Apple Devices. Step 2: HDMI Port: connect to your TV or big screen via HDMI cable. Step 3: lightning connection: connect into your iPhone, iPad, iPod. Step 4: Please click the "Trust" and wait 5 seconds to synchronize the phone screen with the TV. ★Due to HDCP copyright protection measures, the lightning to HDMI adapter doesn't work with some paid contents including Netflix, Amazon video, DIRECTV, HULU and other App which need to be paid fee. 【High Quality to 1080P HD】 The Lightning Digital AV Adapter supports mirroring of what is displayed on your device screen - including apps, presentations, websites, slideshows and more to your HDMI-equipped TV, display, projector or other compatible display in up to 1080p HD. Apps Supported: YouTube, Office, Safari, Chrome, Facetime etc. 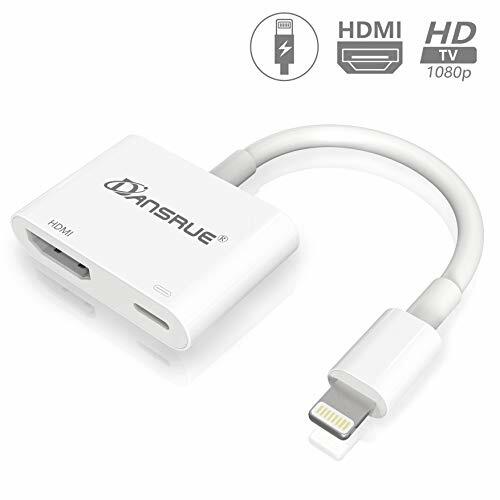 【Wide Compatibility】 Lightning to HDMI AV Adapter Compatible with iPhone X, 8,8 Plus, 7,7 Plus,6,6 Plus,6S,6S Plus,5,5c,5s,SE; iPad with Retina Display, iPad mini,mini 2,mini 3,mini 4,Air, Air 2,iPad Pro(9.7-Inch) and iPad Pro(12.9-Inch); iPod Touch 5th Gen(32gb and 64GB), iPod Touch 5th Gen 16gb, iPod touch 6th Generation. 【Easy To Carry】 With light and small design, it is very convenient to carry and connect your iPhone, iPad anytime to a HDMI-equipped devices for home entertainment (watching movies, sharing pictures and more), business meetings, education, training and etc. 【Not Compatible with HDCP】 Not Compatible with Apps which have "HDCP" video copyrights protection like Netflix, Amazon video, DIRECTV, HULU other App which need to be paid fee. We warrant this item 12 MONTHS and 30 Days of easy returns from date of the original purchase for manufacturer defects, please feel free to contact us if you have any questions. If you have any questions about this product by Ivendita 1900, contact us by completing and submitting the form below. If you are looking for a specif part number, please include it with your message.